These delicious Cheddar Chorizo Pinwheel Bites are one of my favorite easy appetizers! They can even be made a day ahead so you can enjoy the party! Hey, guys. This is Kristen from the blog The Endless Meal. I’m so excited to be back here at Real Housemoms to share this recipe with you. I just know you’re going to love this one! Over on my blog, I normally share easy to make and healthy, family-friendly recipes. If you like that sort of thing (and I know you do!) then make sure you sign up here and I’ll send you 2-3 awesome new recipes each week. When I’m at my blog, I don’t tend to share recipes made with puff pastry. You know, it doesn’t really fit into that whole “healthy” thing. But … I LOVE how flaky and tender it is and how it can make any appy feel extra special. 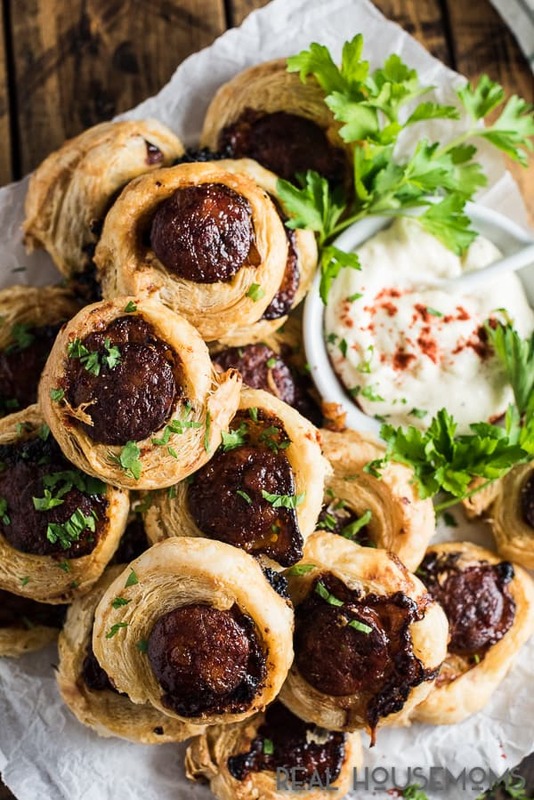 These chorizo pinwheel bites are a delicious combination of spicy/ cheesy/ buttery/ and a little sweet. It’s a little bit of everything amazing all in one bite. Just imagine biting through buttery pastry, chewy spicy chorizo, and melty cheese. In the background, there’s a tiny hint of something sweet. And then there’s the garlic dipping sauce. Not that these guys need to get any more amazing, but dips are more fun than no dips. It’s kind of over the top, just the way they should be. These bites would be perfect for your Christmas or New Year’s holiday entertaining. They can be prepped a day in advance so all you have to do is take them out of the fridge and pop them in the oven when guests ring your doorbell. They also travel well so you can bring them to a potluck. 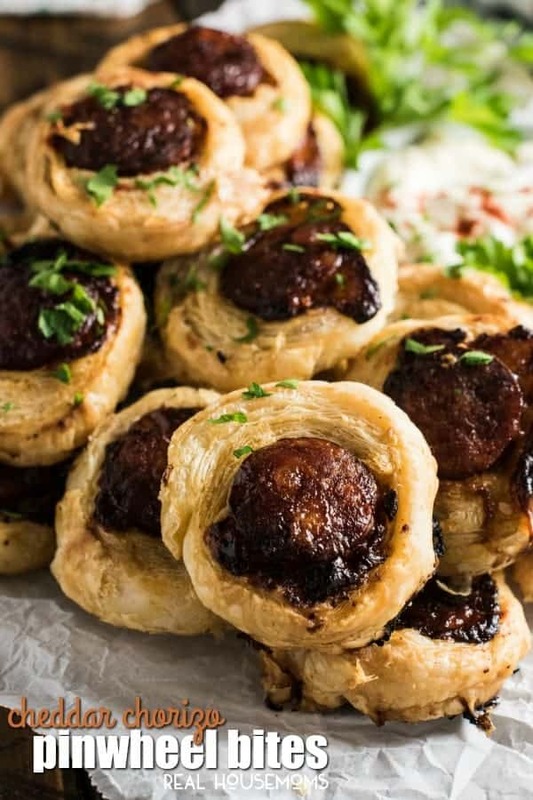 Can you promise me you’ll make these chorizo pinwheel bites? You will be the star of your household when you put these on the table. Pinky swear. 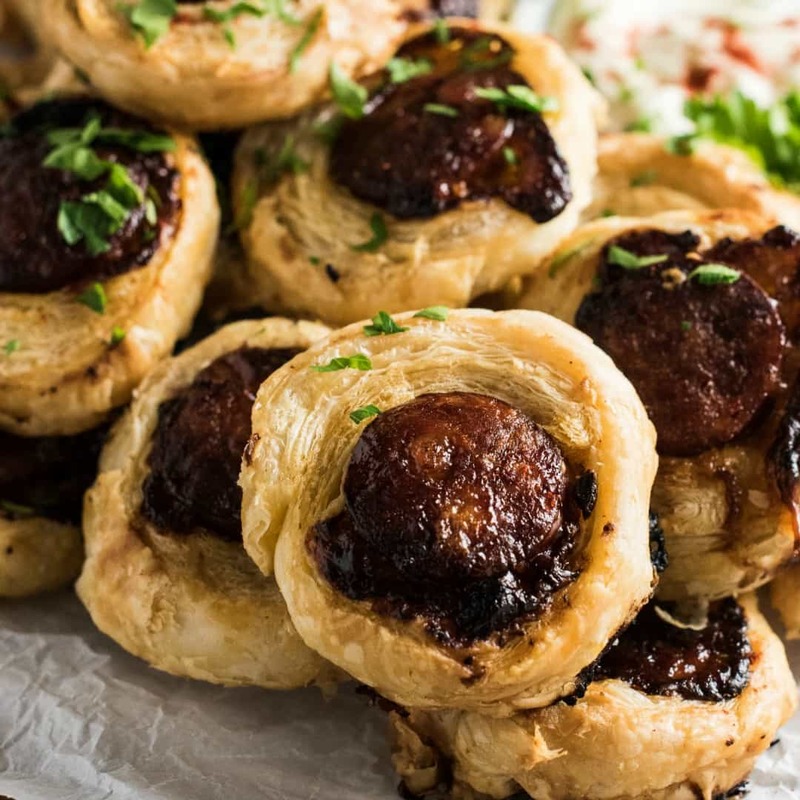 These delicious Chorizo Pinwheel Bites are stuffed with cheddar and drizzled with honey then baked until the pastry is puffed and golden. 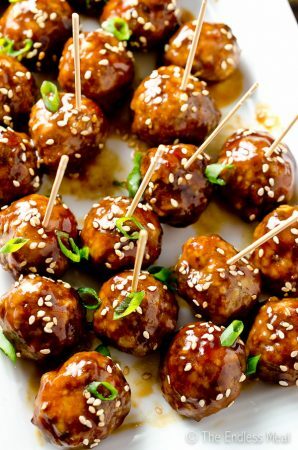 They can be made a day ahead for a quick and easy appetizer. Preheat your oven to 375 degrees. Line an 11x13 inch baking sheet with parchment paper. Working with one piece at a time, roll out the puff pastry on a lightly floured surface until it is just larger than the chorizo. Sprinkle 1/2 cup of the cheese down the center lengthwise and then drizzle with 1/2 tablespoon of the honey. Top with one chorizo sausage and then roll tightly. Seal the seam with a little water then twist the ends shut. Repeat with the other puff pastry. Slice each roll into 10 equal slices and place the rounds on the lined baking sheet. Bake in the oven for 25-30 minutes, or until the pastry is puffed and lightly browned. While the chorizo pinwheels are baking, prepare the garlic mayo dip by mixing all the ingredients together in a small bowl. Serve the pinwheels topped with a little sprinkle of paprika and some parsley. The chorizo pinwheels can be made up to one day in advance and stored covered in your fridge until you are ready to bake them.